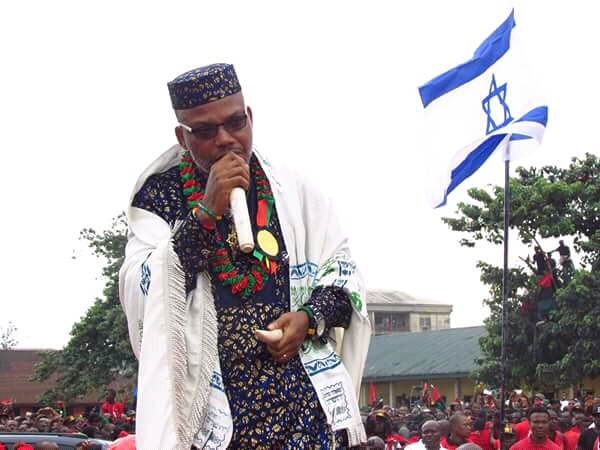 The world is yet to comprehend and understand the man behind the mic via Radio Biafra. A man that could challenge a sitting government with facts and figure without firing a shot. He speaks and the world listens because his kind comes once in a century. We the Indigenous People Of Biafra (IPOB) cherish and love his confidence and never die spirit. He is so much convinced on that what he is seeking for and fighting for is inevitable. What manner of man is him? There is panic in the corridor of power in the contraption called Nigeria. The northern caliphate is in the state of coma and the Cabals can’t help it either. Even the impostor Jubril Aminu Al-Sudani impersonating Late Mohammadu Buhari is panicking because he will be exposed and disgraced. Both the APC and PDP are not even giving peace a chance. Indeed, there is fire on the mountain. However, the Sultan of Sokoto is even lamenting that he is afraid that Nigeria meant break and he said: “If Nigeria has these troubles in 2019 then, I have my fears over 2023. The signs are already on ground. Brothers no longer talk to each other. Friends are now divided in a very terrible way because they have been insulting one another before the election. Neighbours now hate each other because they belong to different political parties". This is morning, Nigeria is at the bricks of collapse, Mazi Nnamdi Kanu has sent the Missile that would destroy this crime against humanity (Nigeria). Below is his broadcast on the 14th April 2019, read and digest. Speaking further, Kanu argued that for the All Progressive Congress, APC, to assert that Atiku was not a Nigerian citizen based on his (Kanu’s) earlier revelation on Radio Biafra meant that even APC had accepted his narratives. He said: “The headline ‘Atiku Is Not A Nigerian, APC Tells Tribunal”, is a vindication that everything I say on Radio Biafra is the truth. It may appear outlandish and unbelievable at first, but eventually history always vindicates me. It is now over the Atiku’s team to unleash what they have against Jubril. “I will offer free legal advice to Atiku live on air in the hope that they will use it because it is obvious Atiku won the election and APC are deploying all instruments of coercion at the disposal of the Nigerian state to deny him his mandate.” Between Atiku and the man occupying Aso Rock, only Atiku is a Nigerian, the other is Sudanese. “Buhari died in 2017 and should not be contesting any election in 2019. There was a gentleman’s agreement amongst Fulani cabals of which Atiku is privy to, that the death of Buhari should not be made public lest IPOB take full advantage of it to break Biafra away from Nigeria.” Atiku played along believing that Jubril and APC won’t put up much resistance when it comes to presidential elections. He was wrong. The cabals have now refused to give up power. Jubril is their poster boy.” APC is counting on the fact that Atiku won’t fight dirty in public because that means authenticating the claims of IPOB and confirming what world leaders already know, that Buhari is dead. The only people who have refused to believe it are Nigerians. “The only option left for Atiku is to remind the tribunal that he is an authentic Nigerian citizen whereas Jubril is not. No part of Sudan ever joined Nigeria as a result of referendum, at least not yet. “Atiku should demand for a DNA test result to ascertain if Jubril is Buhari or not. Once he lays this card on the table, the cabal will have no choice than to return his stolen mandate. “Out of the two contestants, one is a Nigerian by choice not birth but the other is neither a Nigeria by birth nor by choice. “Atiku became a Nigerian by referendum at the age of 15 but Jubril in his mid-50 is not a Nigerian, does not hold Nigerian citizenship and is from Sudan. “What Kyari and his gang have done is worse than a military coup. Their role in inflicting hardship on long suffering people of Nigeria and by extension, Biafrans, is unpardonable. “They should be tried for high crimes and misdemeanours. They are supposed to be stoned according to Sharia Law. “Another issue which Atiku’s legal team should home in on is the issue of WAEC certificate. Like a place of birth, WAEC certificate is a cardinal requirement as stipulated in the constitution. “The headline “INEC says they are satisfied with Buhari’s certificate” is utter nonsense because INEC is not an examination body. The only authority capable of authenticating Jubril/Buhari’s certificate is WAEC and they are still in existence. “Is INEC WAEC? The answer is a capital NO. Only WAEC can respond to the issue of WAEC result not INEC. “The examination body is there, still existing. If PDP bigwigs have any brain, they will subpoena WAEC boss to testify under oath. “That will send Jubril sculling back to Khartoum Sudan. But PDP leaders are cowards without the spine to fight a tyrannical impostor. To finish APC is easy but PDP lacks the balls. “Should WAEC boss lie under oath, he or she will be tried for perjury. This is elementary law. Should they forge a result on a paper that has been aged artificially, there is carbon dating technology that will tell us when the paper was made. “This is a full proof process. Buhari before his death had no certificate, Jubril has no certificate and the section 131 (4) of the Nigerian constitution is quite explicit on this, no WAEC certificate no presidency. What are Atiku and his team waiting for? “The issue of WAEC result can be dealt with now at this tribunal, not in a Nigerian court of law with an APC corrupt judge. If they won’t allow WAEC boss to be called as a witness, get a sworn testimony under oath and Jubril will be a goner.” Kyari and his cohorts who brought in Jubril to replace Buhari failed to reckon with the fact that no two individuals, even so- called identical twins, are exactly the same in every way. Goodbye Nigeria, welcome to the republic of Biafra. The centre could no longer hold, to your tent oh! Nigeria. All hail Biafra the children of the light.